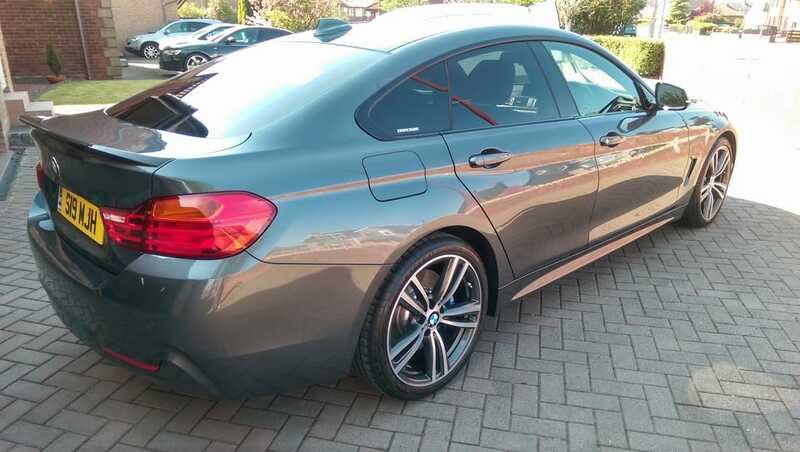 ​My New Car Protection Detail consists of me applying one of my quality Ceramic Coatings which provides from 12 months up to 5 years plus paintwork protection with the right after care. These Ceramic Coatings become the new surface of your vehicles paintwork and will protect your vehicle from light scratches & swirl marks. There will be no need to polish or wax your vehicle, the ceramic coatings will provide that just waxed glossy look for many years even after washing and drying your vehicle. ​All to often I have seen new cars with no paintwork protection, give your car the best start and have the paintwork protected from the elements. The New Car Protection Detail is a service I offer for your new or nearly new car, my protection package is a more cost effective service than the over hyped and priced protection packages offered by car dealerships. ​My Ceramic Coatings will outshine & outlast the New Car Protection packages such as Autoglym Life Shine, GardX, Swissvax and Diamondbrite that cost from £200 - £500 plus. These packages are all to often applied incorrectly by unskilled valeters who are not given the right amount of time to apply these correctly. My New Car Protection Detail will typically take around 2 days to complete correctly, giving your vehicle the best start. Our Top of the range ceramic coating comes with a 5 + year warranty. ​• Wheels are fully cleaned with fallout remover / wheel cleaner, removing brake dust and any tar spots. • Entire vehicle exterior pre-washed to remove soiling prior to contact wash.
• Entire vehicle clay barred to remove bonded contamination creating a super smooth paintwork surface. • Vehicle polished to create a high gloss finish ready for the application of ceramic coating. • Exhaust tail pipes polished to restore their appearance. • Tyres and trim dressed to enhance their appearance. Please note these coatings must be applied and carried out at my workshop to allow protective paintwork coatings to bond to the vehicle and work correctly. ​KubeBond Diamond 9H ceramic glass coating is that revolutionary product that creates a superior layer to keep car surfaces strong and shiny, just like a diamond. All it takes is just one application and minimal maintenance. KubeBond Diamond 9H contains a cubic ceramic molecular matrix structure that offers excellent resistance against scratches and chemicals. The surface coated by KubeBond Diamond 9H adds a hard cubic ceramic layer, giving the best protection from damaging contaminants and harsh chemicals, and also, staying cleaner for longer. Because the KubeBond Diamond 9H can only be applied by a professional, we at DMD Detailing have attained the approved applicator certificate to help our clients protect their assets. Contact us to find out about what is the most suitable treatment for your car. ​Once NanoX Ceramic Coating has bonded to your vehicle it transforms the paintwork into a shiny surface that is resistant to all weather conditions. This is a result of the ceramic molecular net of the coating that enables a strong protection and creates a surface that stays clean for a longer period. NanoX creates a surface that is UV resistance, high gloss and super hydrophobic. ​The dealership will normally charge around £200 + for their New Car Protection Package and take between 30 minutes to 1 hour to protect your new vehicle. With minimal preparation the coating will never last and live up to its so call claim of life time sealant. My New Car Protection packages start from £265 and is a comprehensive service taking from 1 day up to 36 hours depending on which package you choose. This gives the time to properly prepare your car before the coating is applied and the curing after its applied. Pressure wash and wash with sponge. Apply so called life time sealant. Wheels cleaned with a non-acid wheel cleaner and various brushes. Pre-Wash including high pressure rinse of wheel arches. Tar remover & specialist chemicals applied to paintwork & bumpers to remove contamination. Exterior hand washed using a wax-friendly car shampoo and sheepskin wash mitt. The vehicle's paintwork is then wiped over with a specialized Clay Bar Towel to remove any remaining surface contamination. Door shuts and sills cleaned. Hand dried using plush microfibre cloths. A machine polish of paintwork before final stage of paint protection. Ceramic Coating is applied to vehicle. ​Contact us on 07402223002 to book the New Car Protection Detail or to find out about what is the most suitable treatment for your car.